Volkswagen has recently revealed its first generation Golf GTI Cabriolet and now it will be taking this car to the Geneva Auto Show next week. The focus with the 2013 Volkswagen Golf GTI Cabriolet has been to bring some power and suspension to the ‘top less’ compact segment vehicles. 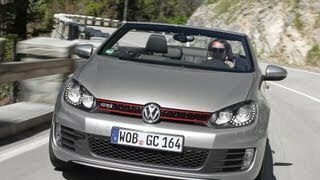 Rumors started buzzing for a drop top Golf GTI Cabriolet during the 2011 GTI Worthersee Meet in Austria last year, where VW even showcased a drop top version of the Golf GTI and the Golf R.
But has VW managed to do a good job with the 2013 Golf GTI Cabriolet? It must be maintained that putting the GTI badge to a car can be a very risky business since it automatically raises the expectations of the consumers regarding that car, which can at times be impossible to meet. 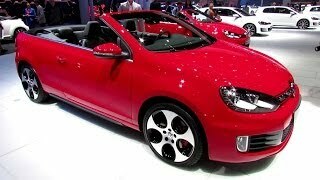 Let’s just hope that Volkswagen hasn’t shot themselves in the foot with the 2013 Golf GTI Cabriolet. 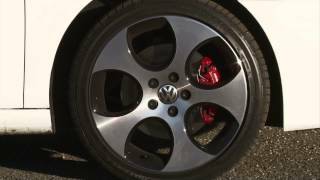 Under the hood, the 2013 Volkswagen GTI Cabriolet is powered by the same old 2.0 liter turbocharged direct injected 4-cylinder engine with a max output of 207 HP and a peak torque of 207 lb-ft. Joined to a six-speed manual or automatic transmission, the engine makes the car gallop to 62mph in a matter of just 7.3 seconds and a top speed of 147mph just a shade lower (2mph) than the Golf hatch. But the GTI version does get the hatch’s XDS differential lock and electronic differential lock to help the front wheel get the required power. As far as the look of the Golf GTI Cabriolet is concerned, there is no surprise that most of the styling cues come from the Golf hatchback. The front of the car is adorned by a honeycomb mesh grille completed with the red headlights and the GTI badge. The inflated front bumper houses the inset fog lights. In the back, the black rear diffuser and the LED taillights along with the dual chrome tailpipes certainly brings back sweet memories of the GTI hatch. The sporty feel of the outside have been carried to the inside of the car as well. There one will see a leather steering wheel and red accent stitching on the seats. Vienna leather seats are optional. The fabric leather roof takes just 9.5 seconds to lower at speeds not exceeding 19mph. With the roof down the Golf GTI Cabriolet has double the space of a MINI convertible at 250 liters. 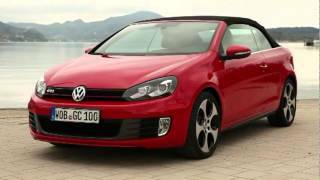 The 2013 Volkswagen Golf GTI Cabriolet will be available for order in UK from July this year with deliveries starting from September. Price of the vehicle has not been announced yet, but get ready to pay something around 27,000 GBP to have one these babies in your garage. The most powerful Golf Cabriolet ever is here! Wolfsburg / Geneva, 29 February 2012 - Exactly one year ago, Volkswagen presented the new Golf Cabriolet at the Geneva International Motor Show. Now, at the same venue, the top version of the bestseller is making its world debut: the first GTI Cabriolet in the history of the Golf! The GTI engine crowns the open-top four-seater with 155 kW / 210 PS of power, making it the most powerful Golf Cabriolet ever. GTI does not only mean more power, but also a sportier exterior and interior and precisely tuned running gear. The first Golf GTI Cabriolet models will be delivered just in time for the official arrival of summer.